Tags are very important in the world of Beanie Babies. 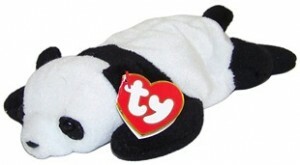 If a Beanie Baby is missing a tag it’s value can decrease by up to half! As you may already know, Beanie Babies have Â two types of tag, a swing tag and a tush tag. 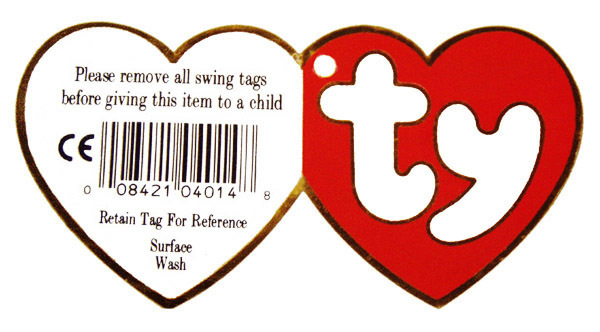 A swing tag is the red heart-shaped tag that usually hangs from your Beanie Baby’s ear or wing. 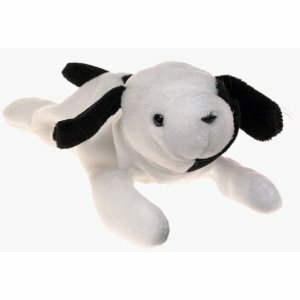 A tush tag is the fabric tag that is attached to the Beanie Baby’s rear end! This post talks about swing tags. There are currently 19 generations of swing tag, each with their own differences. There are also variations between different parts of the world, for example, a 17th generation swing tag in the UK and EU is different from a swing tag from the USA. This post will go on to explain each generation of swing tag and highlight any differences between countries. This was the very first generation of swing tag appearing at the beginning of 1994. It was just a simple red heart with Ty written on the front in white. 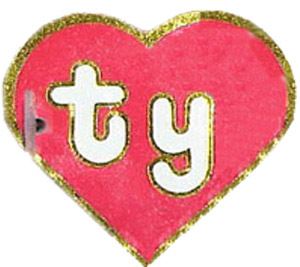 The original Ty logo consisted of very thin writing compared to the thicker logo of today. Surrounding the edge of the heart is a gold border. This swing tag was the only generation of tag not to open like a book. 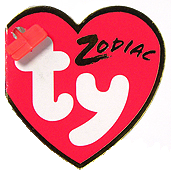 Instead it was a simple tag that had the Beanie Baby’s name and style number on the back. 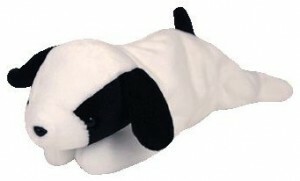 Beanies coming to the UK with a 1st generation swing tag had a white sticker stuck to the rear side of the tag and the very first Beanie Babies to enter the UK were forced to have a white rectangular swing tag instead of the heart-shaped tag to conform to UK laws that required plush toys to have the “CE” mark present. Only the original nine had these tags. 1st generation Beanie Babies were either made in China or Korea. The 2nd generation of swing tags were introduced in Spring 1994. the first to open like a book. These tags still had the skinny Ty logo and were sometimes called a “double tag”. 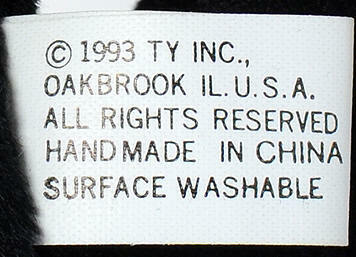 The inside of the tag is white and on the left hand side is written where the Beanie Baby was distributed from. This can either be the address for North America, Germany or the UK. On the right hand side is the name of the Beanie Baby followed by the style number. Underneath the name can either be a To/From section or copyright and care information. On the back is the barcode and the words “Retain tag for reference”. These tags were only available on Beanies with 1st generation tush tags. 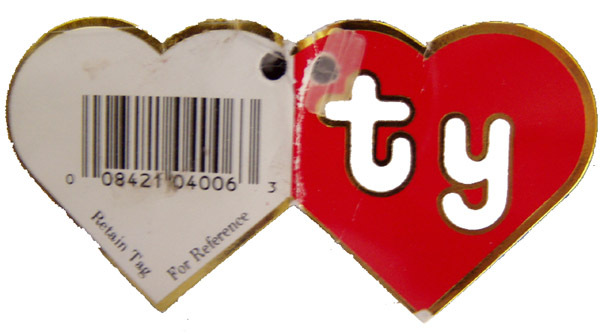 The 3rd generation of swing tags started using the newer thicker Ty logo, known as the “bubble font Ty logo”, which was white and outlined in gold. They started appearing in Spring 1995. This generation still opened like a book. 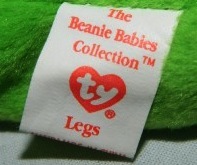 Inside the tag is very similar to the 2nd generation in that the name and style number of the Beanie Baby are still located on the right hand side, followed by a To/From section. 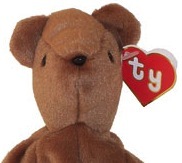 Some versions of this generation have a trademark symbol after the word “Babies” in “The Beanie Babies Collection” and later versions of the tag have added Ty’s corporate addresses to the left hand side. At the top of the rear of the tag it now says that you should remove the tag before giving it to a child. The CE mark has now appeared next to the barcode. Underneath the barcode it says “Retain Tag for Reference” followed by “Surface Wash”. These swing tags appear on Beanie Babies with 1st and 2nd generation tush tags dated 1993 and 1995. 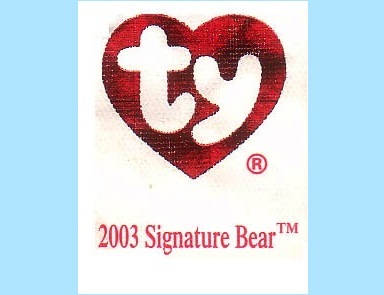 The 4th generation of swing tags started to appear in Spring 1996 and added a yellow star to the top right of the Ty logo with the words ‘ORIGINAL BEANIE BABY” inside the star written in black capital lettering. The gold outline has disappeared from the Ty logo, which has shrunk a little to fit the star on the tag. The inside of the tag has had a bit of an overhaul. 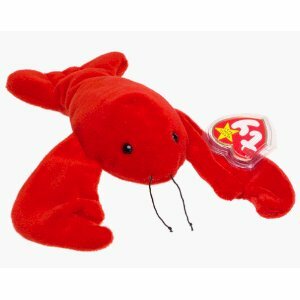 Next to the name of the Beanie Baby is a â„¢ symbol. The style number is still present, however, the To/From section has disappeared to make way for a short background poem about the Beanie Baby. Ty’s web address has also been added underneath the poem. There can be a 3rd, 4th or 5th generation tush tag present with the 4th generation swing tag, each dated either 1993, 1995 or 1996. The 5th generation emerged at the start of 1998. In many ways they were like the 4th generation. The font inside and outside the tag has now been changed to Comic Sans. 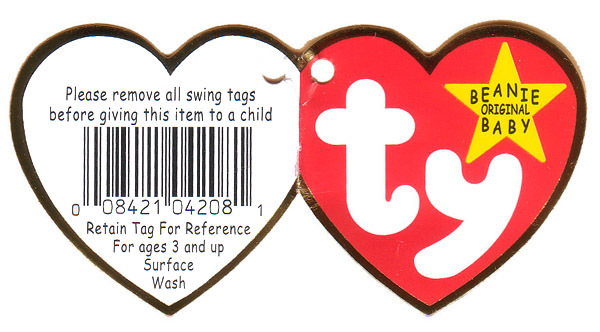 At the top left of the inside of the swing tag, there is now an Â® next to “The Beanie Babies Collection. Ty UK and Ty Deutschland have now been taken off the corporate addresses and replaced with Ty Europe and Ty Canada. the Ty Europe address can either be Fareham, Hants or Gosport, Hampshire (sometimes misspelled Gasport). 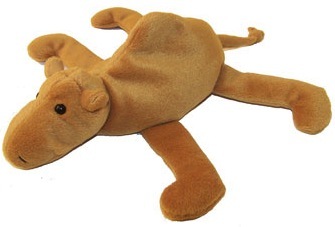 The Beanie Baby’s birthday is now spelled out in full and the style number has vanished. Some tags have misspelled “Surface Wash” as “Suface Wash”. Most of these have also misspelled “ORIGINAL” as “ORIGIINAL” on the yellow star on the front of the tag. These swing tags should come with 6th, 7th or 8th generation tush tags. The 6th generation appeared in 2000. The yellow star on the front of the 4th and 5th generation tags has been replaced with a holographic star with “2000” written across it in yellow. These tags still feature the Beanie Baby’s name, birthday and poem on the left of the inside of the tag. The corporate addresses have now been simplified to the just the locations, such as Ty Inc., Ty Canada, Ty Europe, and now, Ty Japan. The barcode on the rear has reduced in size to make way for the words “safety precaution”. The 6th generation also brought with it the Zodiac swing tag. 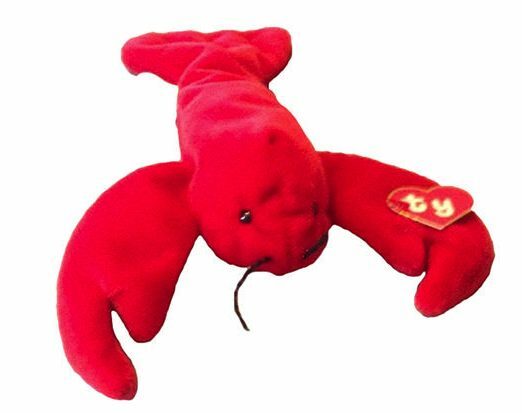 This was reserved exclusively for the Zodiac range of Beanie Babies depicting animals from the Chinese Zodiac. This tag replaces the holographic “2000” star with the word “Zodiac” in gold foil writing. The rest of this tag is identical to the regular 6th generation swing tags. 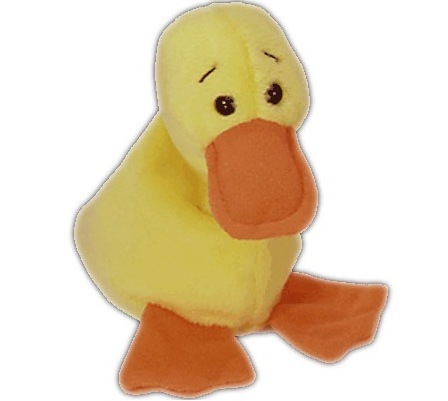 This generation appeared in early 2000 and was only used for Beanie Babies shipped to the UK and Germany. The 7th generation still uses the holographic star, but has replaced the “2000” with the word “Beanies” written in yellow across the star. The corporate addresses have been changed to allow room for the full Ty Europe address in Gosport (sometimes misspelled as Gasport). 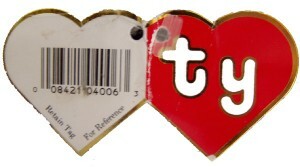 This swing tag was used on Ty Europe Beanie Babies right up until the 13th generation tag began to appear. The 8th generation began to appear in January 2001. The holographic star has now shrunk to allow the word “Beanie” to appear over the top of it and “Baby” underneath, both written in yellow. This tag was not available with Ty Europe Beanie Babies. Inside the tag is absolutely identical to the 6th generation swing tags. The rear is also exactly the same. The 9th generation of swing tags appeared in Summer 2001. They are almost identical to the 8th generation, except for where the words surrounding the holographic used to read “Beanie Baby”, it now reads “Beanie Babies” in yellow writing. On the rear of the tag, the wording has slightly changed on the safety information. 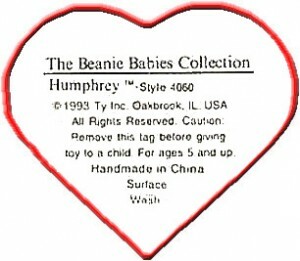 These tags were issued to Beanie Babies distributed in the US and Canada only, and didn’t appear in Europe. 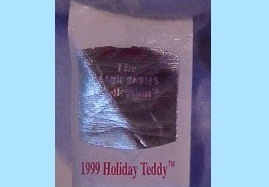 Birthday Bears began to appear in July 2001 with these swing tags. They appeared at the same time as the 9th generation. The front of these swing tags differ to the 9th generation in that the holographic star has disappeared and been replaced with a yellow birthday cake with seven red and green candles on top. Inside the birthday cake, the month that the bear represents is written in multicoloured lettering. The inside has also changed. On the left hand side, the month that the bear represents is written in capital lettering. Underneath, it either has a poem (earlier bears) or states who shares a birthday on that month (later bears). On the right hand side, HAPPY BIRTHDAY is written and underneath is a To/From section. The website address is located under the To/From section. The 10th generation appeared in January 2002. The holographic star has now changed to the words “Beanie Babies” written in yellow on two separate lines. Five tiny holographic stars sit above the writing. 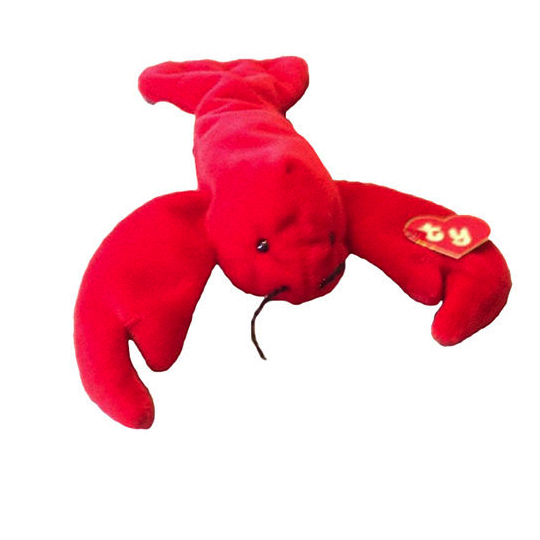 The 10th generation was only attached to Beanie Babies distributed in the US and Canada. The 11th generation appeared in December of 2002. Further changes have been made to the front. Where the five stars on the top right of the previous tag were, there is now a holographic “10” above the yellow “Beanie Babies” followed by a small white star with “yrs” written inside it. The inside of these tags remain identical to the 10th generation apart from now two locations have been added to Ty’s corporate address list. These are Ty Asia and Ty Australia. 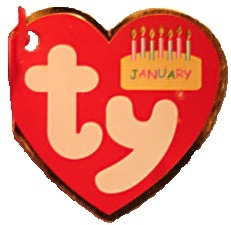 The Beanie Baby of the Month swing tags started appeared in January 2003. On these tags, the yellow “Beanie Babies” in the top right and the “10 yrs” have been replaced by a yellow “Beanie Baby of the Month” badge with white lines emanating from it. The inside of the Beanie Baby of the Month swing tags are identical to the 11th generation tags. This is considered by some to be an offshoot of the 11th generation given it’s similarities. The US version of the 12th generation swing tags replaced the “10 yrs” with the word “Original” in holographic writing above the yellow “Beanie Babies” writing and added a holographic splash underneath. The inside of the 12th generation is the same as the 11th generation. There are slight variations of this swing tag. The State exclusive bears have a slightly different tag from other Beanie Babies, replacing the poem inside the swing tag with facts about the State they are representing and a State flag replaces the corporate addresses and includes further information about the State, such as the State’s official web address. This is the first change in the UK swing tags since the 7th generation. The EU version of this swing tag is very similar to the US 12th generation, apart from the yellow “Beanie Babies” only says “Beanies”. The inside of the tag is very similar to the US version, except that it now has the full Ty Europe address in Gosport. An new white tag is now present just behind the swing tag because of safety regulations. Tush tags are the small fabric tags that are attached to a Beanie Baby’s rear end. There are 13 generations of tush tag, each with slight differences. 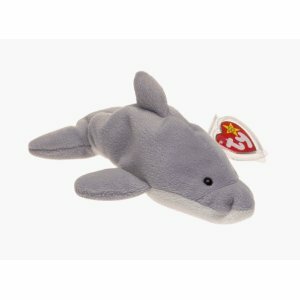 There are also Canadian tush tags, and a few rare Beanie Babies have an embroidered tush tag. Below each tag is explained in detail and features a picture for easy identification. 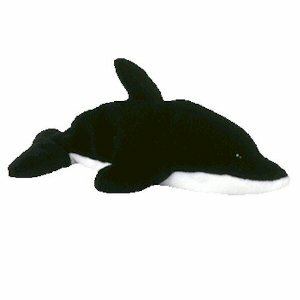 The original Beanie Baby tush tags were black and white in colour. 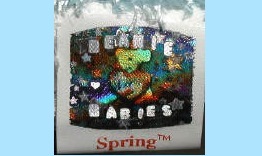 Beanie Babies with this tag will also have either a 1st, 2nd or 3rd generation swing tag. The copyright dates dates on these tags should either be 1993 or 1995 and these tags may say “For ages 3 and up” and some tags have CE written on them. 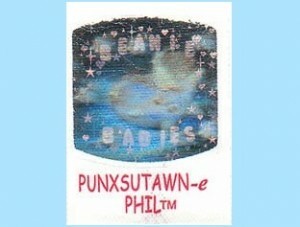 The name if the Beanie Baby will not be written on the tush tag. This generation of tush tag will either have “HANDMADE IN CHINA” or “HANDMADE IN KOREA” written on it. The 2nd generation began to use the red heart with “Ty” written inside on the tush tag. An Â® symbol can be seen to the lower right of the heart logo. The 1993 or 1995 copyright dates can be seen on these tush tags. The 2nd generation tush tags still don’t feature the name of the Beanie Baby. The first tags in this generation state “For ages 3 and up” but the later releases don’t. The 3rd generation added the words “The Beanie Babies Collectionâ„¢” to the top of the tush tag. The red heart has decreased in size but still has the Â® symbol to the lower right of the heart. 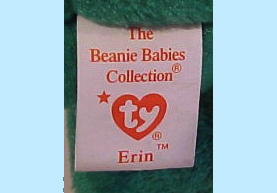 The name of the Beanie Baby is now present on the tush tag underneath the heart and these tags can now have the copyright dates of 1993, 1995 or 1996. There are various mistakes associated with this tag. Some Libearty’s had the word “Beanine” instead of “Beanie” and instead of “Surface” on Sly’s tag, it said “Sufrace”. The 4th generation added a small red star to the top left of the heart. In between the process of changing from the 3rd generation to the 4th generation, the star was initially on a clear sticker until in the later 4th generation tush tags, it was eventually printed straight on to the tag. This was the only alteration to this generation of tush tag. The copyright dates on this generation can either be 1993, 1995 or 1996. It will either say “HANDMADE IN CHINA” or “HANDMADE IN KOREA” on the tag. 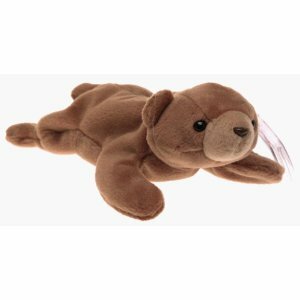 In October 1997, the 5th generation of tush tags appeared on Beanie Babies. Many changes appeared on this tag. 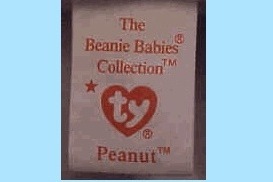 On the part of the tag where it says “The Beanie Babies Collection”, the Â® symbol has now appeared after “Babies”. After the Beanie Baby’s name, there is now a â„¢ symbol. There is still the copyright dates of 1993, 1995 or 1996 available with this tag generation. “HANDMADE IN KOREA” or HANDMADE IN CHINA” is also present on this tush tag. The 6th generation tush tags appeared in January 1998. Once again, there are many changes to this generation. The Â® symbol has disappeared from after the word “Babies” on “The Beanie Babies Collection” and is now present after the word “Collection”. These tags will either say that the Beanie Baby has PVC pellets or PE pellets inside it. 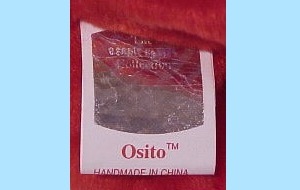 As of June 1998, some of the tags included a red chinese stamp inside them, indicating the factory that the Beanie Bay was made in. There are now two more copyright dates that can be present. The 6th generation can either have 1993, 1995, 1996, 1997 or 1998 on them. Either “HANDMADE IN KOREA”, “HANDMADE IN CHINA” or “HANDMADE IN INDONESIA” will be printed on these tush tags. The 7th generation tags began appearing after January 1999. A brand new hologram is now present, replacing the red heart symbol and “The Beanie Babies Collection. The Beanie Baby’s name is located below this hologram. In the middle of the tush tag is a pale heart symbol which is heat activated and disappears when heat is applied. 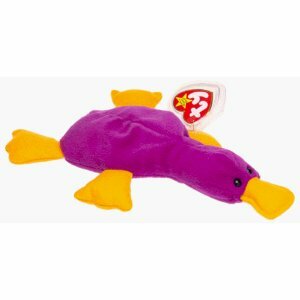 This has been added to help to identify between real and fake Beanie Babies. The Chinese stamp that was present on the previous generation has now disappeared. The 8th generation tush tags aren’t a whole lot different from the 7th generation tags. The only difference is that the tush tag is no longer a loop and is now just a strip of fabric with the hologram logo and all the same details as the 7th generation tush tags. The Beanie Baby’s name is located below the hologram with a â„¢ symbol after the name. The 9th generation tush tags appeared in March 2000 and reverted to the original loop tag design. There is still a hologram on these tags, but now you can either see a “Ty” heart or a star at different light angles with “Beanie” above the heart and “Babies” below it. Hearts and stars are dotted around on the hologram. An 8 digit alpha numeric code is printed inside the tag and the heat responsive heart is still located Â on the inside too. The 10th generation tush tags started to appear on Beanie Babies in January 2001 and feature a new hologram. 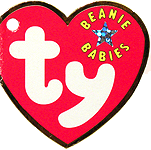 The background of the hologram features the words “Beanie Babies” written in diagonal lines. The “Ty” heart is still in the centre surrounded in hearts and stars. 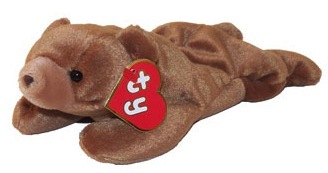 The name of the Beanie Baby is located underneath the hologram followed by the â„¢ symbol. 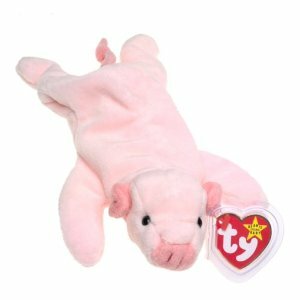 The 11th generation tush tags were announced on 27th December 2001 and began to appear on Beanie Babies in January 2002. They can either be dated 2001 or 2002. The hologram has changed yet again, now with the new design of a Teddy Bear holding a “Ty” heart in it’s arms. The Beanie Baby’s name appears below the hologram with the â„¢ symbol at the end. The 12th generation tush tags appeared in 2002 with the new 11th generation swing tags. They first appeared on a Mastercard Anniversary special edition bear. The hologram has dropped the Teddy Bear in favour of a “Ty” heart with smaller hearts and stars in the background. 2002 or 2003 dates can be present on these tush tags. Later versions of the 12th generation tags moved the CE on to a separate line of writing and was made larger. The 13th generation tush tags began to appear in 2003. The design had a complete overhaul and ditched the hologram in favour of a simple red foil “Ty” heart design. There is an Â® symbol located to the lower right of the heart. You can either find a 2003 or 2004 copyright date on these tush tags. 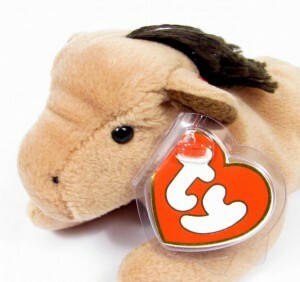 In the UK, Beanie Babies with the 12th generation swing tags appeared with 13th generation tush tags which were slightly different in that they had the UK Gosport address and didn’t state that they were made in China like previous versions. In 2004, later versions of this tush tag appeared. The red heart lost it’s foil effect and the white “Ty” had now changed to gold. These tags had a copyright date of 2004. 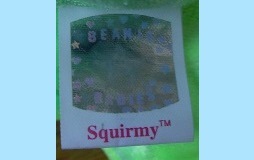 Beanie Babies that have been distributed in Canada include an additional tag on them underneath the usual tush tag. 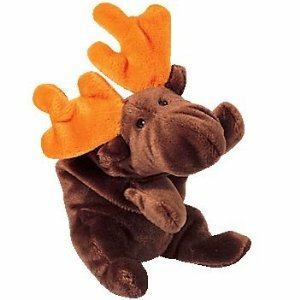 This Canadian tag is added to meet Canadian toy import regulations. It is a white tag with black writing on and is written in English and French. 2002 versions of these import tags became much thinner. Some very rare Beanie Babies with a 2nd generation swing tag and a Canadian import tag feature an embroidered tush tag. This tag includes the copyright date of 1994, whereas no other tag has this date. 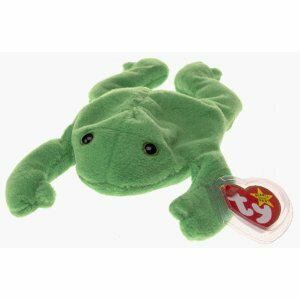 The embroidered tags are thought to be a mistake and it is incredibly rare to find a Beanie Baby with one attached as they are normally reserved for Ty Classic Animals.